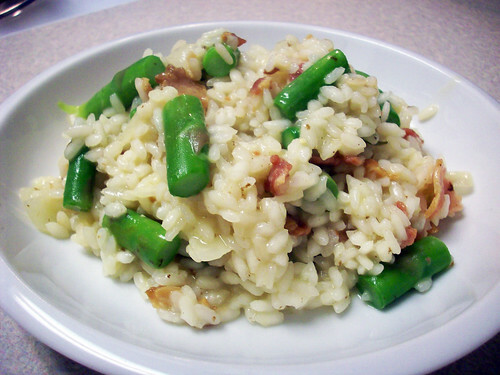 One of my favorite relatively easy weeknight meals is risotto. If you are not familiar with making risotto it can seem intimidating, but really its just a lot of stirring. Although risotto is traditionally served with minor accoutrements, to make it more of a full meal, I like to add lots of veggies and typically some protein. What I add usually depends on the season. For example, zucchini in the summer, butternut squash in the fall, beets in the winter and asparagus in the spring. 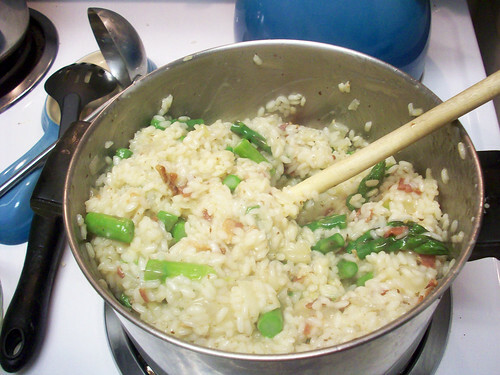 In this particular risotto, I used asparagus and prosciutto. Steam the asparagus for approximately 5 minutes. Drain and put in an ice bath to maintain the green color. Once cool, cut into bite sized pieces and reserve to add to the risotto at the end. Keep the broth warming on the back burner. Saute the bacon in a large saucepan until crispy. Remove from pan with a slotted spoon and place on a plate with a paper tower. Skim most of the bacon fat out of the pot with a spoon. Keep approximately 2 tablespoons worth of fat to saute the onion and risotto. Add the diced onion to the pan and saute for approximately 3 minutes. Add the rice to the pan and saute until the it becomes mostly translucent. Once the rice is translucent, add the wine, stirring constantly until it is absorbed. One large ladle at a time, add the broth to the rice, stirring constantly until each ladle is absorbed and rice is al dente (approximately 15-20 minutes). Take off the heat and fold in the asparagus, bacon, butter, parmesan, salt and pepper. Texture should be creamy and consistency should be not so liquid that it falls off the spoon, but just enough so that when you serve it on your plate it spreads. Note this risotto is a little stiff. I hurried the process a little because I was hungry which is a big no-no, although it still tasted delish, the texture was not 100 %. Hope you enjoy! I'm typically fine with creativity for the dinner department, but what about lunch? I hate buying lunch because it can add up, but I also get tired of my usual staples, such as sandwiches, or even leftovers. What are some of y'all's creative, easy lunch ideas? PS. Today marks the 1 month countdown until my move! Ahh! This looks so delicious! I love all of the ingredients and I am sure I will try this soon! 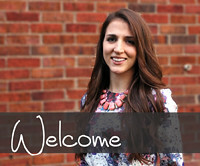 So glad you came to visit today at my little bloggy, I always like making new friends! Oh yum. I hated when my mom made this growing up because she'd make me stand there and stir and stir and stir. Haha. Can't wait to try this one! @Sara let me know how it works out if you make it! @Aubrey Thanks for stopping by! Sometimes I wonder if Odin is possessed too. @Alena I can completely relate. My dad would make me stir, but on the bright side, that's how I learned to cook!